The DR900 Universal Signal Conditioning Module can isolate and convert over 100 combinations of analog signal ranges. The DR900 converts and transmits signals linearly proportional to the input, while the DR900-SQRT transmits the scaled square root of the input signal. This allows the DR900-SQRT to provide a signal that is linear to flow rate in applications utilizing a differential pressure transducer. DIP switch range selection eliminates the need to order and stock different modules for each input and output signal range, and allows quick and convenient setup for over 100 standard signal conversions. By utilizing the Field mode of calibration, the user can customize the input and output scaling for odd applications, including reversal of the output relative to the input. In addition to the conversion capabilities, the DR900 modules feature optically isolated Input/Output signal circuits and transformer isolated Power to Input and Power to Output circuits. The modules’ overall full scale accuracy typically exceeds 0.05% depending upon range selection and scaling. The microprocessor based design provides ease of field scaling and the onboard E2PROM stores scaling values for future recall. Both models come factory precalibrated for all input and output ranges. Factory or custom field scaling can be selected by a simple mode switch change. The DR900 can be factory recalibrated in the field if desired. The modules environmental operating temperature range is -20 to 65°C (-4 to 149°F). DIN rail mounting saves time and panel space. The units are equipped with universal mounting feet for attachment to standard DIN style rails, including top hat profile rail according to EN50022 – 35 x 7.5 and 35 x 15 and G profile rail according to EN50035-G32. DR900 modules feature "3-Way" Signal Isolation. The 3-Way isolation is a combination of optical and transformer isolation. The optical isolation provides common mode voltage (CMV) isolation up to 1.5 kV between the sensor input and the process signal output. The DR900’s power is isolated from the sensor signal input and the process signal output by a DC/DC transformer isolation circuit. The DR900s accept a full range of process signal inputs and isolate and convert these signals to common industrial control signals. The input signal combinations are configured by making specific DIP switch selections on the 10 position DIP switch. As with the input choices, the process signal output of the modules is DIP switch selectable. 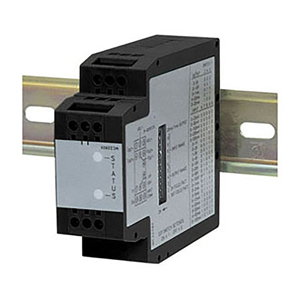 A one position DIP switch is used to select between the 1 mA/20 mA output ranges. The maximum output current signal is 22 mA with <600 Ohm output resistance and the maximum output voltage signal is 11 V with >1 KOhm output resistance. The input zero and span are set by first applying the minimum value then transitioning DIP switch S1-2 to store that value. Next, the full scale value is applied and the DIP switch transition stores the value. The output scaling is performed in a similar manner but the output is driven to the desired minimum and full scale values by the calibration source applied to the input. DIP switch S1-1 is used to store the minimum and full scale output values. The span is defined by: span = (full scale - minimum scale). Factory: ±0.1% of span max for all ranges except 1 mA, 2 mA, and 20 mV. These ranges are accurate to ±0.2% of span max. All ranges can be field calibrated to 0.1% of span max. Mounting: Standard DIN top hat (T) profile rail according to EN50022 - 35 x 7.5 and 35 x 15 and G profile rail according to EN50035-G32. 참고: Supplied with complete operator’s manual.